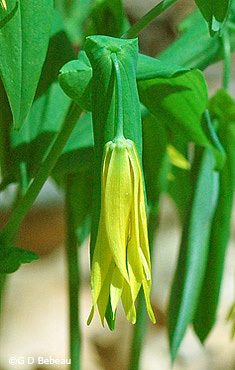 Large-flowered Bellwort, Uvularia grandiflora Sm. One of the two Bellworts in the Garden (the other is Wild Oats), Large-flowered Bellwort is a native erect perennial spring forb that ranges from 8 to 20 inches high on stems that fork above the middle into 2 or 3 divisions. Young plants maintain a single unbranched stem. Leaves: Unlike it's smaller cousin, the leaves not only clasp but are pierced by the stem. 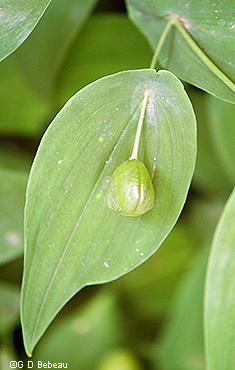 One leaf is usually placed just below the lowest branch of the stem. They are oblong-ovate, with smooth edges, pointed tips, parallel veins, smooth on top and usually hairy on the veins on the underside, up to 6 inches long and 2 inches wide. The inflorescence consists of 1 to 3 flowers per stem with the stalk having a perfoliate bract below the flower, [above it as you view it, as the flower stem nods downward] the bract resembling a small leaf. Flowers are 6- parted with petals and sepals are combined as 6 tepals, pale to golden yellow in color, in an elongated twisted shape with pointed tips. These nod due to the weight on the upper stem. 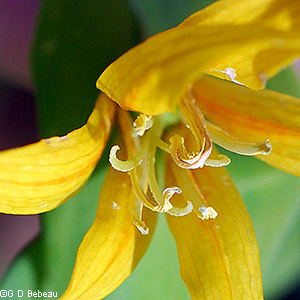 The reproductive parts are 6 stamens with yellow anthers and a tripartite style whose lobes arch outward at maturity. Seed: At maturity a 3-lobed (celled) seed capsule is formed that has 2 truncated beaks on each lobe with each cell containing several seeds. Propagation by seed is difficult as the seeds must be kept moist and require a warm moist period followed by a cold moist period. Sow fresh seed and let it overwinter for germination the following year. 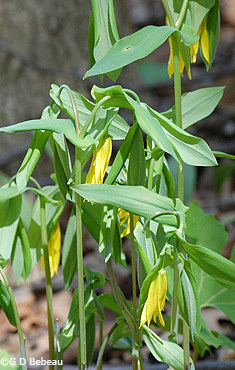 Habitat: Large-flowered Bellwort grows from a cluster of fleshy rhizomatous roots without stolons. The root system can vegetatively spread and produce multiple stems forming a nice clump which is usually not hidden by other plants until after the blooming period of late April - early May (see 'Comparisons' below). The plant prefers a neutral to limy soil and will compete well with trees as it flowers in dappled sunlight before tree leafout. Heavily shaded areas should be avoided. Names: The genus Uvularia is derived from the anatomical term uvula, meaning a lobe hanging from the back of a person's palate, and refers to the hanging flowers of this genus. The species grandiflora simple means 'large flowered'. The author name for the plant classification, ‘Sm.’ is for James Edward Smith, (1759-1828) English botanist, founder of the Linnean Society of London, author of numerous papers and books on botany including Flora Britannica and the the 4 volume The English Flora. He purchased the entire collection books, paper and specimens of Linnaeus upon that man’s death. Comparisons: Once you see this plant, it is an easy one to remember. During the years Ken Avery was Gardener (1959 to 1986) he reported Large-flowered Bellwort has bloomed in the Garden as early as April 15 and as late as May 7th. There was no change to those dates during Cary George's tenure as Gardener. Above: 1st photo - Above the flower is a green bract resembling a small leaf and pierced by the flower stalk. 2nd photo - The flower combines petals and sepals into 6 twisted tepals. 3rd photo - The seed capsule has 3 cells or lobes, each cell producing seed. Below: 1st photo - The six stamens with their long yellow anthers surround the style whose three spreading lobes are visible between the anthers. 2nd photo - After pollen release the curve of the styles is more noticeable. 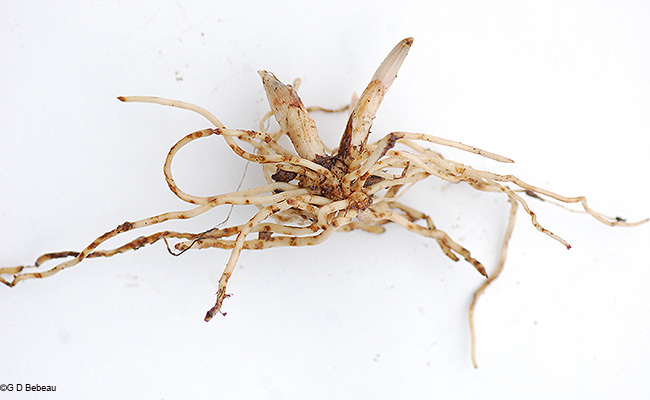 Below: The root system of Large-flowered Bellwort, showing the rhizomes and two new shoots. 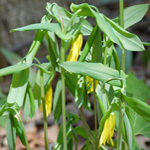 Notes: Large-flowered Bellwort is indigenous to the Garden area. Eloise Butler catalogued it on May 25, 1907. Martha Crone planted it in 1947, '48, and '54. Cary George planted additional plants in 1993 as did Susan Wilkins in 2009 and 2013. The plant is native to most counties in Minnesota except those without deciduous woods as in the SW corner, the far NW corner and the tip of the Arrowhead. In North America it is a plant of the eastern half, found in the U.S. from the central states eastward except for Florida and Maine. In Canada it is found in Manitoba, Ontario and Quebec. 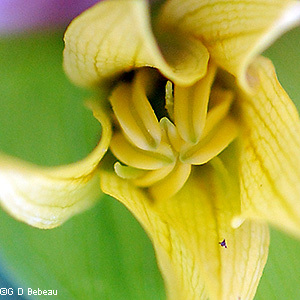 This species and U. sessilifolia are the only two species of Uvularia found in Minnesota.